Jagged Fence in association with Making Productions is currently presenting the London premiere of Laurie Slade’s acclaimed new version of August Strindberg’s The Father. Slade’s version had its world premiere at the Belgrade Theatre, Coventry, in a production directed by Joe Harmiston. Now with a new cast and creative team, Slade’s version proves that Strindberg’s play is as controversial and as relevant now as it was when it first appeared in 1887. Director Abbie Wright makes the claims of misogyny made against the play look like a cowardly excuse for avoiding dealing with a complex masterpiece about male-female relations. Toronto and classical theatre companies nearby, have always been too wary of presenting plays that might offend. Strindberg, with his reputation for misogyny, has put him on the too-hot-handle list for too long even though no one questions his importance in the development of modern drama. Paradoxically, David Mamet and Neil LaBute, who also have reputations for misogyny, are frequently performed while the plays of a master of world drama have languished. 2013 and 2014 saw a spate of versions of Strindberg’s Miss Julie (1888), but the last professional production of The Father in Ontario was by the Tarragon back in 1990. Soulpepper last presented a play by Strindberg in 2002, the Shaw Festival in 1987 and Stratford in 1977. Luckily, a regional theatre in Coventry proved more daring than any of Ontario’s main classical theatre companies. While the character of the Captain is undeniably a misogynist, as is a character like Petruchio in Shakespeare, Strindberg’s dramatic instincts are too strong to allow the play to become single-sided tirade. For a play to be dramatic, at least two points of view have to come in conflict and The Father demonstrates this to disturbing effect. The title character of The Father is the Captain, Adolf (Alex Ferns), a military man who is clearly more comfortable with a hierarchical structure of duty and obligation than with a life of shared responsibility and compromise entailed in marriage. Adolf complains to his brother-in-law, a Pastor (Robert Wilfort), that he is forced to live in a house full of women – his wife Laura (Emily Dobbs), their daughter Bertha (Millie Thew), his old Nurse Margret (June Watson) and even his mother-in-law (who is never seen). Adolf’s view that women are inherently vicious, deceitful and without conscience shocks the men he confides in like the Pastor and the Doctor (Barnaby Sax), who is to be his new lodger. When Adolf gives as evidence of female disloyalty the fact that a bereaved woman allowed him to seduce her, we can’t help but see that Adolf reframes the story to suit his prejudice. The conflict between Adolf and Laura comes to a head over the future of their daughter Bertha. Laura wants her to become an artist and live at home. Adolf wants her to become a teacher and live in town. Bertha, tired of her parents’ constant fighting, understandably wants to leave home and live in town. Adolf dogmatically asserts that as Bertha’s father he has a right to determine her future. To this, Laura deliberately plants the seed of doubt by asking him how he knows for certain that he actually is Bertha’s father. Who, indeed, does any father (up to the advent of DNA testing), know that a child is his? Adolf’s remarks have already shown him to be unhinged or very close to it. He has already displayed paranoid tendencies by claiming that everyone in the household is against him. He even suggests that Laura had a sexual relationship with their previous lodger and is now having one with the Doctor, even though he has only just arrived. We can see easily that it is his own extreme views of women that have brought him to such a highly wrought state not unlike Shakespeare’s Othello. Laura’s latest insinuation is the final straw. She is very like Iago and Desdemona rolled into one because once the doubt about his fatherhood is planted, Adolf cannot get rid of it. Wright has deliberately relocated the action to the 1950s, the last decade when there was no definite way to prove the a child’s fatherhood. Yet, Strindberg’s story is more complex than that of a man whose rigid worldview causes him to break rather than bend with change. It is also about Adolf’s wife Laura who knows this about her husband and uses his very misogyny as a weapon against him. In order for her to retain possession of Bertha and retain a living allowance, Laura cannot drive Adolf to suicide because then she would not have the advantage of his pension. Her goal is to drive him just so far off the edge that he is certifiable which would allow the pension to continue. Despite Adolf’s view that women are inherently devious and cunning, Strindberg shows that Laura is no expert at either. Before the Doctor ever meets Adolf she very clumsily suggests that he is going mad because sees beings on other planets through a microscope. When the Doctor speaks to Adolf he discovers that Laura has mistaken a spectroscope for a microscope and “beings” for molecules. Laura’s other schemes are so obvious that Adolf discovers them easily. 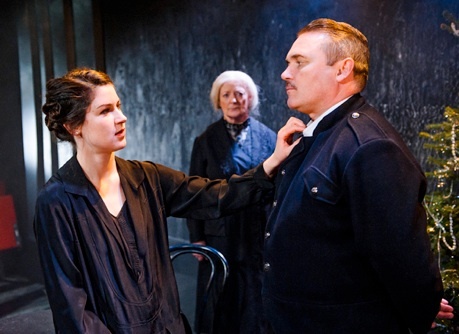 The play begins with Adolf assigning blame to a soldier Nöjd (Thomas Coombes), who got a girl pregnant even though he claims he is not the father. It is this one idea that Laura happens upon that eats away at him now. The point is not that Laura is expert at driving Adolf mad but that her fight with Adolf over Bertha should reach such a point that she would resort to such an extreme. The reason the play has not dated is because the point is really not about paternity but trust. The Doctor tells Adolf that Goethe once said, “A man must take his children on good faith”, to which Adolf retorts, “It's risky to take anything on good faith where a woman is concerned.” Inherent to Adolf’s misogyny is a lack of faith and that very lack has engendered a similar lack in Laura in trying to deal with him. Strindberg’s own skill as a dramatist has thus created a play that is much more an indictment of misogyny than the misogynist tract it is made out to be. It also is a true tragedy since the father is brought down by the hubris he has in his own beliefs. Director Abbey Wright begins the action by adding a short silent scene with Bertha playing alone. She does this to reinforce the point that possession of Bertha is what mother and father are fighting for. From the first scene after that on, Wright ratchets up the tension so inexorably that by the grotesque ending one is left virtually breathless. There is no question that in Wright’s hands The Father is theatre at its most gripping. Wright has an ideal cast for the task. When Alex Ferns first appears as the Captain we can tell he is wound up and inwardly fuming. He barely has his thoughts or emotions under control and will often shout a response when such emphasis is not necessary or helpful. His recurrence to the same topics, such as womankind’s viciousness, show his obsessive nature. His paranoia makes him regret confiding in the only men in the house – the Pastor who is Laura’s brother and the Doctor who is the new lodger. The only two people he can relax with are Bertha, of whose love he is justly confident, and his old Nurse. Adolf claims that the Margret still treats him as if he were a child. In fact, the most unsettling aspect of the play is that Adolf immediately reverts to childhood whenever he is alone with Margret. The greatest proof that Adolf is mentally unstable is how quickly he transforms from a puffed up soldier to a helpless little boy. Ferns makes these transitions so completely believable, a kind of retreat from the real world, that they help explain why Adolf is so unable to handle conflict. Ferns is so deeply sunk into his character it is frightening and we can sense what he is thinking even when he isn’t speaking. For her part, Emily Dobbs as Laura is the exact opposite. For most of the action her face is an enigmatic mask flickering between coolness and malice. In the few time Strindberg allows her to be alone, lash out or express desire, we recognize that Laura has adopted this mask to deal with Adolf’s manic outbursts. Her expression seems studied because it is – it is a method she has devised of not giving away her feelings to combat a man who always does. She also adopts this façade because she knows it infuriates her husband that he can’t read her as well as everyone else. Dobbs creates this impression with great care but also shows that Laura expends a great deal of energy to generate this illusion of control. June Watson is absolutely wonderful as the Nurse. She makes it quite clear that the Nurse does nothing to cause Adolf’s retreat into childhood. But once he reverts she indulges his mood because it seems that this alone is when he is happiest. The scene near the end where she coaxes Adolf into a straightjacket is so disturbing now it’s hard to believe it was written in the 19th century. Watson has Margret go about her gruesome task so calmly because as Adolf’s Nurse she has only ever wanted what is best for him. All the rest of the cast offer excellent support. The play is staged in the Trafalgar Studio 2, the smaller of the two Trafalgar spaces, holding only 100 people. Its seating around three sides of the playing area will remind Ontarians most of the Court House Theatre at the Shaw Festival, although that seats more than three times as many. To see a play of such violent emotion played so convincingly in such a small space is an overwhelming experience that will have you cringing in your seat. This is such a powerful production of such an unquestionable great play that you will leave wondering why theatres back home are so wary of staging it. At least they are not in Britain and any theatre-loving visitor to London should take advantage of the fact. Photo: (from top) June Watson and Alex Ferns; Emily Dobbs, June Watson and Alex Ferns. ©2015 Tristram Kenton.